Under the auspicious of U.S. Foundation for International Economic Policy and the National Asian Pacific Center on Aging, with the co-sponsorship of Japan's Ministry of Health, Labor and Welfare, Embassy of the United States of America in Japan, Aichi Prefecture government, Kasugai city, Konan city, Sun-Life and Sun Vision Social Welfare organizations, Aichi Social and Welfare Organization and other professional and academic entities, the symposium was held in Nagoya city in Japan on February 21,2004. 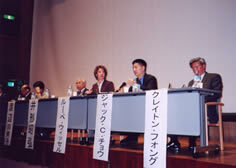 The participants to this symposium included the delegates from the United States and Japan. On the U.S. side, it was headed by Dr. John B. Tsu, Chairman of U.S.Foundation for International Economic Policy who is also serving in his capacity as Chairman of President's Advisory Committee on Asian Americans and Pacific Islanders, Ambassador Jack C. Chow, MD, who was Personal Representative for Secretary of the State in charge of HIV/AIDS and is now assigned to be Assistant Director General at WHO, Mrs. Marie Guadalupe Wissel(Lupe) who is the Staff Director of the U.S. Senate's Special Committee on Aging and Mr.Clayton Fong, Executive Director of the National Asian Pacific Center on Aging and serving as Chairman of Asian Pacific American Institute for Congressional Studies. On Japan side, the delegates included Ms. Yumiko Watanabe, Senior Policy Planning Official at the Bureau of the Elderly of the Ministry of Health, Labor and Welfare, Dr. Akihiro Igata, President of Nagoya University of Arts and Sciences who has been active in many important area of Japan's Social Policy being promoted by Japanese government, some of the role he has been playing are a member of the Ministerial Commission on Japan's Long Term Care Services Insurance System and on other ministerial commission, Dr.Teruhisa Mokuno, CEO of Sun-Life and Sun-Vision Social & Welfare Organization (not for profit) and Distinguished Visiting Research Professor at John F. Kennedy University. Professor Daisaku Maeda of Japan Lutheran College has acted as the moderator for the symposium who has also been active in Japan's Social Policy as a member of a numerous ministerial commission at Japan's Ministry of Health, Labor and Welfare and other regional governments in Japan. The opening remarks by the delegates from Japan and the United States were presented by Ms.Yumiko Watanabe, representing Japanese delegates and its counterparts in the United States were presented by Ambassador Chow and Mrs.Wissel, followed by remarks, views and discussions by the delegates which focused on some of the pressing issues aging facing both Japan and the United States. Since the purpose of the symposium was designed to enhance the bilateral relationship on the issues of health and long-term care services in comparative analysis between Japan and the United States, all delegates expressed the importance of the further enhanced collaboration and cooperation to cope with the issues of aging and its relevant matters in the bilateral relationship. Dr.Tsu has made his remarks in expressing the importance of this kind of symposium in order to have the shared knowledge and concerns in dealing with the issues of aging and stated further that the furtherance of the bilateral relationship on health and long term care services is equally significant as same as trade, national security and other areas of the bilateral relationship because of the fact that the issues of aging have already impacted on the growth of economy and other areas of socio-economic factors which are needed to have more insight for the enhanced bilateral relationship. A special message from the Hon Yoshiro Hayashi, former Minister of Health and Welfare and the Honorary Chairman of U.S.Foundation for International Economic Policy was read at the symposium site in which he congratulated on the success of this event and emphasized the importance of the bilateral relationship on health and long-term care services for the elderly in the era of growing aging society.